rear knuckle upper spherical discussion - Page 6 - Miata Turbo Forum - Boost cars, acquire cats. I dont think the 3/4" 6061 aluminum spacers will work for me. by the time I drill them out for a 12 mm camber bolt and try to clamp them up between slotted adjustment holes they crush the ends way too easily for lack of contact surface area and low yield strenght. ill make some steel for you this week. leafy was nice enough to make a proper drawing for me so im going to start getting quotes this week. those interested keep an eye on this for the next week or so for developments. I have some 316 stainless coming. I can send you material if you like. I ordered enough to re-do all my sleeves actually. Im going to try the bronze bushings inside the urathane trick for all the other locations. for the bushings that are held in place with adjustable cam bolts I have them all drawn up where Im using a 3/4" center and making 4mm thick 7/8" od washers on the ends to intrface with the adjustment slots. I think the setup might have some advantages over Delrin. Energy suspension urathane bushings are designed around 7/8" OD inner sleeves. FYI upper rear bolts are 10mm, cam bolts are 12mm, and the long bolt on the front upper and rear lower outboard are 14mm shank. I ordered 5ft of 3/4" and 1 ft of 7/8" od cold finished 316 stainless, and 40 3/4" ID 7/8" OD X 1" long teflon/oil impregnated bronze bushings. I hope this will create a low static fruction freely articulating suspension that also won't bind. Bob you may want to think about the bronze bushings for thrust loads on the bearings too. Especially the lower inners front and back, since having them offset (like toe and caster offset) pushes the poly into the sub frame ears adding extra friction there as well. It would help the uppers too since those see some loading on that face in braking/accelerating. Bascially, order the flanged version of the bushings you're thinking about and sand the poly bushings thinner by the thickness of the flanges. If everything is sized right there'll be some clearance between the flange and the sub frame tab and that will be the bearing surface. I couldn’t figure out how to incorporate the thrust flanges in with the stock urethane bushings. Part of the advantage to keeping with urethane over harder materials is that it will tolerate some dimensional inaccuracies. Full metal or even delrin will bind up or have slop if the tolerances are not spot on for bushing and sleeve length with all surfaces flat and parallel. Full spherical/rod ends would be best in that respect but I have seen a lot of bad designs for A-arms that incorporate those as well. The urethane makes the thrust washers easy though. Just use bronze bushings with flanges, and use the belt sander to make just the poly part of the bushing narrower by ~the thickness of the bronze flange. Actually taking a little less off would be better, help you remove some more play from the bushing. The bronze stays stuck to the poly, the steel is held solid by the clamping action of the bolt, and the bronze rotates on the steel sleeve axially and on the subframe in the thrust direction. 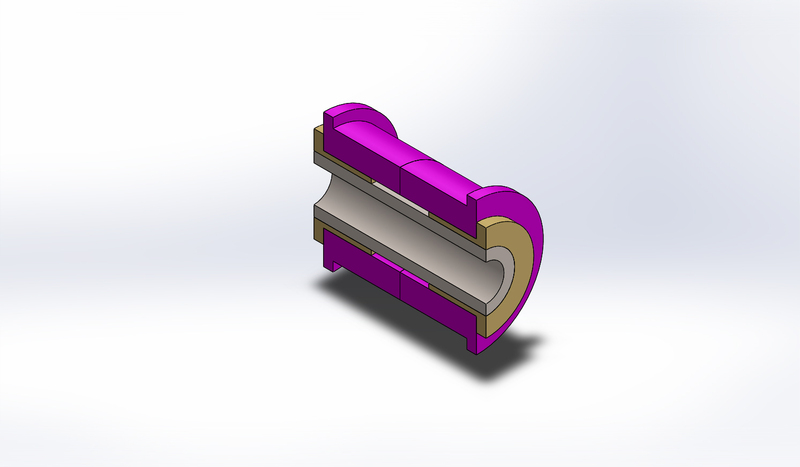 The only part here that requires tight tolerancing is the bearing fit between the sleeve and the bronze bushings and the length of the sleeve, there should be a gap between the bronze bushings inside the poly. 3/4" inner sleeve diameter won't work well with adjustment slots. have to bore the holes in the bushings. Next size up from 3/4" ID bushing is 1". Maybe some type of slippery thrust washer would work but I don't see a good workable way to do it with a flange bushing. i would prefer to work with mild, but if you must, you can send me the SS. I was going to suggest these. I looked into complaints about machining 316L and got mixed results. some people say it machines great and they had no issues others say cutting speed is critical and if it gets too hot it work hardens and becomes a mess. I wanted it for corrosion resistance and higher strrength so it dosn't mushroom the ends after you clamp it down several times changing adjustments. I'll be glad to try Bob, but I can't make any promises. Top be honest I've never turned stainless, but drilling and milling it has proved troublesome in the past. I hate machining 316. If you want something even stronger, you should have gone with 17-4 stainless. It costs about the same as 316, is easier to machine, and has over twice the yield strength as 316 (iirc). 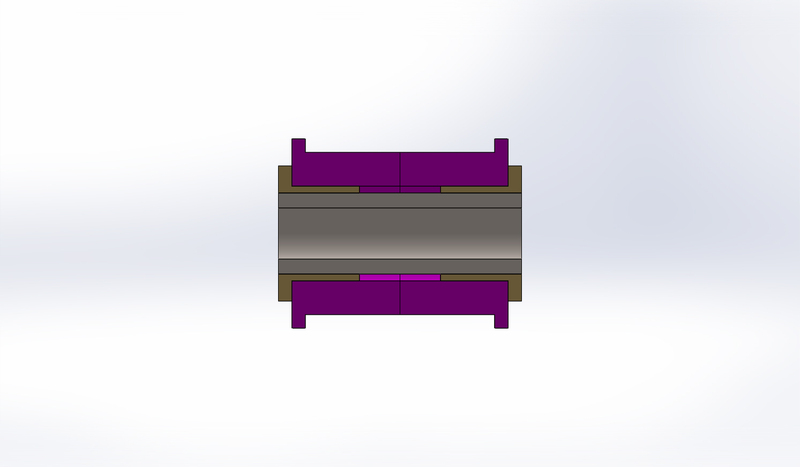 With the 3/4" sleeve going all the way to the adjustment slots in the chassis there is so little area in contact material between the sleeve and the chassis that metal will squish and permanently deform the chassis, the tube or both when you torque it down. The ends of the tubes will mushroom out and it will no longer be a nice round 3/4" OD. I've already seen some of this occur with 7/8" mild steel. it would work fine if there weren't slotted holes for adjustment but I want to keep those. Optimal OD size for a washer in a bolted connection for best distribution of clamp load is 2X the bolt shank diameter which would put it at 24mm, Closer to an inch and 7/8” is already pushing it. I was just comparing cold drawn 1018 and 316 yield strengths. 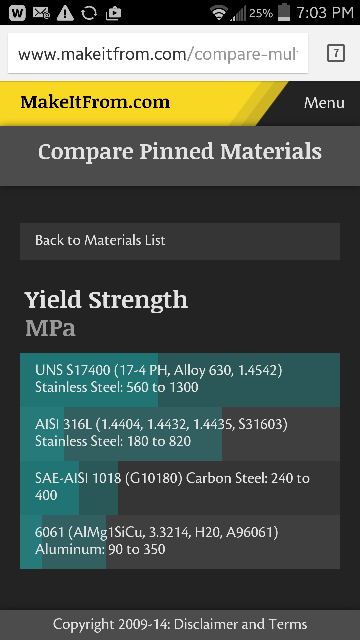 The 1018 has 5k higher yield strength...? Regular (annealed? )1018 is a bit under the 316, is that what you were looking at Bob? Or is my data wrong? Oh now I see your problem after I go through the effort to model it out for you because I thought I was just explaining it poorly. But this is what I was trying to get across, you are correct that only the steel takes the clamping load. Yea two very tiny areas of steel on each end of the thin walled sleeve take all the clamp load where the sleeve makes contact with the flanges on the chassis that have slotted holes. The clamp load can’t really be reduced and have things not slip but as the contact area goes down the contact pressure goes through the roof and metal stars to permanently deform without actually achieving enough clamp load to keep things from moving with applied load. This is stuff that I remember coming to an understanding of very early on in my inevitable path to becoming an engineer as an 11 or 12 year old learning what it took to keep the back wheel on my BMX bike from slipping or tearing up making unusable the rear dropout due to chain line force. Last edited by bbundy; 01-05-2015 at 10:06 PM. Od is 1-1/8" that's almost as big as the urethane bushings. almost fit in v8r arms by themselves. The ID of the tube on the v8r arms is about 1.3"
thats right, i forgot your bushing tubes are smaller. i was thinking stock at ~1.5"